Six Ouyas chilling on Ebay – AS-IS. It was brought to my attention that there was a guy on Ebay selling a lot of six Ouyas as-is and I said “why not? lets see whats going on with them”. And now I have officially received my Six Ouyas for parts on ebay. The final price I paid for six broken Ouyas was $14.00 + $24.99 S&H from Canada to the US Midwest. I thought it would’ve gone for a lot more to be Honest but glad I got it for so low! Anyhow; Allow me to dig in to these. As a repair tech I am super excited about these and am very interested in how Ouyas break and to actually learn from some of these units in the hopes of helping others. Silver Ouya #1 Labeled – “Not Working” WORKS! Okay, do not bother trying to get the “MTP USB Device” operational. It’s a giant waste of time! Although it is nice for the Ouya to show you this while using your Micro-USB ADB/OTG cable. The Ouya will not be doing any “Media Transport Protocol”ing while its soft-bricked. There have been threads dealing with this not only on this forum, but on stack overflow as well. Where the Ouya light turns on. The screen signal is found but it’s pitch black. First troubleshooting step is if you hook up a mini-usb cable to it and over to your PC and it shows “MTP USB Device” that basically means the fail-safe version of android has loaded onto it and when android first books up the only protocol that goes over the OTG port besides charging phones is MTP. That’s it! The Ouya Operating System automatically takes it out of that mode and over to ADB. At first I thought all of the work on my Silver Ouya was for nothing, but no. Apparently I just have a terrible test monitor made by APEX where if you go in any resolution that it’s not rated for (like the recovery mode) it doesn’t behave the same until you power down the screen and back on. I plugged this silver Ouya in my living room Samsung TV and it was totally happy, was able to login and download bombsquad playing happily. YAY! After powering down and powering up my APEX again the Ouya was once again happy with working on my test monitor. So nothing wrong with the console. Now you know why for as dumb as it sounds when Ouya tech support asks you to try your Ouya on another screen it isn’t a far fetched concept that the screen may be really hating the resolution or how much overlay the Ouya is putting out. Same story, except this one does not engage the TV . It does show “MTP USB Device” Regardless. So these may still be hope for this one! This one is a little different. Power it on, no light, fan revs in high speed mode this one may be more difficult to repair. Perhaps the fet for 3.3v is dead and only 5.0v is active . More accurately, this one shows no signs of life what so ever. power button pressed down and no power, no fans, no motions, keyboards do not power up in the USB ports. checked the basic fuses on the back of the board. no good. But all hope is not lost really! Even if I can’t recover the board the Anthracite case is useful. It can be transplanted into a older retail ouya as I can easily install the UF.L Connectors. Anthracite Ouya #5 labeled “Update problems” – Works! This is one the funniest units out of the whole pile! All I had to do is plug it in and let it update. No special tricks or anything! Was perfectly fine afterwards. I have no clue what the buyer was talking about with this one! Anthracite Ouya #6 labeled “Pairing Problems” – Works! The buyer didn’t say anything that this Ouya was missing one of the plastic plates on the top cover that keeps the motherboard level. But Okay, without knowing what’s going on most sellers would dismiss this as a bad gaming unit. But didn’t require anything Crazy. It was hung up on the Purple Screen asking you to pair your bluetooth controller and of course when you try that it did nothing! Well, I knew that purple screen is one of the older firmware screens (pre-chickcharmy i believe) So I busted out my trusty $10 “P3” PS3 knock off controller and usb cable. plugged it into my ouya which automatically disables bluetooth upon hooking it up. the PS3 controllers allow you to hit the home button to proceed with logging in and entering in all of your data. The wireless was also unresponsive on this Ouya as well! So hooked up RJ-45 hard-line. Let it run firmware updates and suddenly wireless is working again! YAY but not bluetooth. Boo! Reboot the Ouya and go to advanced section under Bluetooth and it shows a bunch of different previously paired Bluetooth controllers for a grand total of 2 minutes before it stops only saying the words “Bluetooth turning on.” Well, going through the Ouya forum archives this problem has happened before. Even though this is rare sometimes the Bluetooth service crashes if the table of devices somehow gets corrupted. Luckily Factory Resetting the Ouya clears out that table and like magic the Anthracite Ouya is back online totally happy with both $10 P3 Bluetooth controller and my spare 0x103 Ouya controller. Different antenna and chip-set in anthracite Ouyas. Man, did I learn a lot just off of day 1 of having these Ouyas. I didn’t realize how different the Anthracite casing is versus the original retail. It’s pure ABS plastic versus retail Ouyas aluminum! 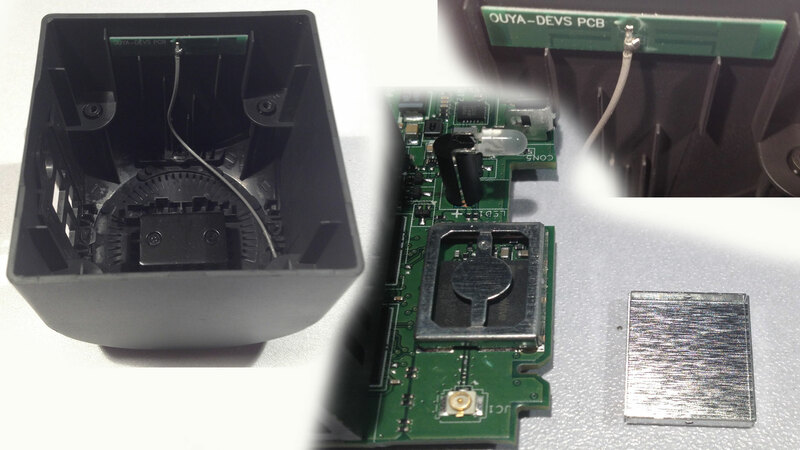 to top it all off, it already does the Ouya Wireless Mod for you! UF.L connectors already on board! so those two factors by itself is the reason why wireless on the Anthracite is almost unstoppable and controller functionality will improve as well. It is a little bizarre how much shielding they put onto the Bluetooth/wireless chip through. Overall , it’s an awesome time, worth every penny. What is going to happen to the Ouyas after you repair them? 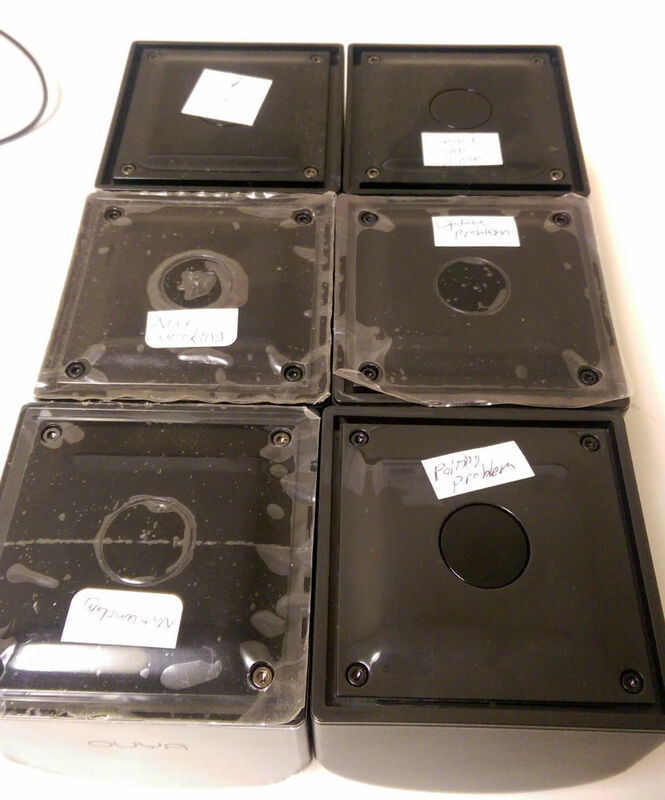 One of the Ouya units (probably the silver one) will be a test subject for future posts . The other ones that are working are already going off to homes, these will not be flipped on EBay or anything like that. I know plenty of people who wanted to have an Ouya but their financial outlook on life has other priorities in mind. Anyhow, I just wanted to post my findings on repairing Ouyas because if this post can help keep at least one Ouya from going into dumpster death then that would make me pretty happy. Take care everyone. Sever bless, and don’t die.